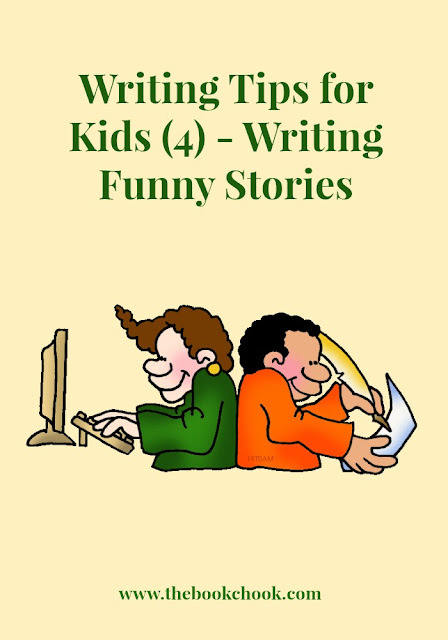 This is the fourth in my new series of writing tips for kids. Over coming weeks you’ll see new short articles, each of them addressing young writers and dealing with a topic helpful to them. I’ve created a new List for these articles and will add to it over time. The List is embedded below. Surprises make us laugh. A surprise can come in a plot idea - perhaps Mayor Fuddle is showing off his new robes when he splashes face-down into a puddle. A surprise might come in a character's name, or because he is not what we expect—e.g. a robot dog called K9, who is very grumpy and bosses everyone about! Funny words make us laugh. Jot some down in your writer's notebook. Three words I like are: rhubarb, razzamatazz, and galumph. In The BFG, Roald Dahl invented great words like whizpop and snozzcumber. What words can you create to make others smile? Sounds can be funny. Writers, especially poets, love to use alliteration (when words start with the same letters). They might choose character names like Prunella P. Pirate. And don’t forget onomatopoeia (when a word represents a sound). You could add clangs, gongs and splatters to your story to make us smile. Understatement is funny. When his science experiment has blown off the school's roof and sent the principal into orbit, your schoolboy character might say, "Perhaps I used a little too much baking soda." Comedy writers often use the rule of threes. They set up a pattern with two things, then break the pattern with a third, giving us a surprise. Maybe you’ve seen that in a three-frame comic strip? For example, a superhero character leaves a message on his answering machine: "I'm sorry I can’t take your call just now. I'm either defeating evil villains, saving the planet, or taking a nap." You might also like to read Writing Tips for Kids - How to Start, Writing Tips for Kids 2 - Write What You Know and Writing Tips for Kids 3 - Developing Characters.